A week from now, several NFL teams are likely to fire their head coach. But the Dallas Cowboys won’t be one of them. After the Cowboys lost to the Seahawks on Sunday, eliminating Dallas from playoff contention, owner Jerry Jones said says he’s pleased with the job head coach Jason Garrett has done, indicating that a head coaching change will not be forthcoming. The Cowboys will enter Week 17 with an 8-7 record. That’s a notable step back from last year’s 13-3 season that ended with a home playoff loss in the division round. However, coming into the season, Garrett had led the Cowboys to the playoffs in two of the last three years. That was after Dallas failed to reach the playoffs in Garrett’s first three full seasons as head coach. But playoff appearances in 2014 and 2016 have been enough to convince Jones that Garrett is fit to continue as the team’s head coach. Garrett was unwilling to talk about his future with the team after Sunday’s game. Much of the speculation about his job security has come from fans. However, Jones appears to have his back, which is all that matters. For what it’s worth, Garrett also appears to have the support of his players. With high expectations coming into the season, the Cowboys began the season 2-3. They started to get it going despite uncertainty regarding Ezekiel Elliott’s suspension. However, the Cowboys lost three games in a row right when Elliott’s suspension started. His return Sunday against the Seahawks was not enough to carry the Cowboys to victory in a must-win game. Despite the uneven season, the Cowboys still have one of the best young quarterback-running back tandems in the NFL with Elliott and Dak Prescott. With a powerful offensive line and a defense that’s quite formidable when healthy, the Cowboys should enter 2018 with plenty of optimism. 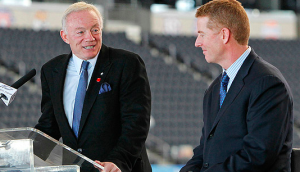 Even Jones, who has been known to act rashly, believes that better days are ahead with Garrett as coach of the Cowboys.